In 1981-82, our family spent a year in California at the Claremont Colleges east of Los Angeles. At the college swimming pool, we met a couple with two young daughters of ages similar to our two. This led to a friendship and a great many joint adventures during the year. They returned to Pullman, Washington State and we returned to a strike bound depressed West Midlands in the UK. We have continued contact over the many years that have now passed, which included our move to Illinois in 1989. Last January we received a telephone call which asked us “Would you be interested in a tour with us to visit some of the National Parks in the West?” If yes, they would book everything and provide their car. Of course, we responded positively to the offer. On a very early July morning we left our home an hour or so from Chicago to take a Delta flight to Spokane, Washington. We did not need to pack too much; just layered clothing that would handle the varying temperatures we might encounter and good walking shoes for the upcoming hiking. 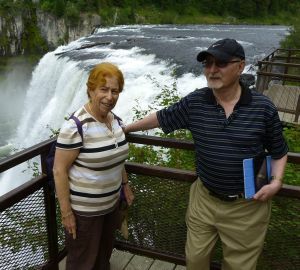 We were met at the airport by our travel companions, a retired faculty member of mathematics at Washington State University and his wife, a former Suzuki violin teacher. She had made all the bookings and planned the route since these sites were not new for either of them. She also knew the importance of reserving lodging well in advance for these popular summer destinations. The typical room rates for a couple are in the range of US$130-180 per night. It is possible to stay within the park boundaries, though it is a bit less pricey to stay in communities just outside the parks. There are innumerable roads along the beautiful valleys and over high mountain passes. It is important to be alert driving, since cars tend to stop when someone in another car spots a creature, or think they do. Often it is convenient to pack a lunch for the day, but excellent restaurants are available at the main tourist centres, offering varied menus at reasonable prices. An added bonus is the number of servers from abroad, usually students working for the summer before returning to their home countries at the end of the tourist season. 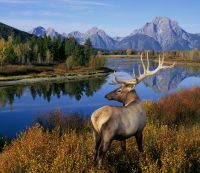 Grand Teton National Park is just a few miles directly south of Yellowstone in northwestern Wyoming. The scenery is unbelievable with waterfalls, sharp peaks, valleys, lakes, and an enormously diverse eco system. The present writer was exhausted walking up a steep forest track and was overtaken by many including older more fit walkers. However, it was worth the effort to reach Inspiration Point to enjoy a stunning view across Jenny Lake far below. On the way down the trail we were passed very closely by a fox with a game front leg. The diversity of tourists is enormous. Even a casual glance at car registration plates in the busy car parks show visitors come from all the states, and there are clearly visitors from around the world. In crowded areas, it is important to be aware of young folks, especially Japanese it seems, taking “selfies”. Glacier National Park is situated in north western Montana just below the Canadian border. It features glorious mountains and stunningly gorgeous lakes. Unfortunately the glaciers are rapidly receding, and just 25 now survive when their numbers were in the hundreds just a few years ago. 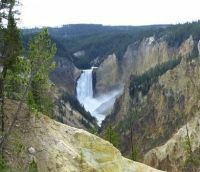 It is best to get around the main areas of the park on the shuttle buses which are free and come by frequently. For example, it is easy to see the sights along the east side of ten mile long Lake McDonald by taking the shuttle. Interesting stops include Lake McDonald Lodge and the Avalanche Lake Trail. There is a pleasant hour long boat ride that leaves in front of the lodge, which gives a nice introduction to the geology and history of the park, and there is a short loop trail along Avalanche Creek. The most dramatic views of the mountains are rewarded to those ascending the famous Going to the Sun Road. The road, constructed in 1932, is literally carved into the steep sides of cliffs to cross over Logan Pass to reach the east side of the park. 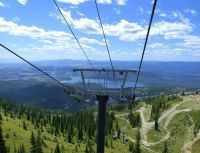 WHITEFISH is a delightful community of around 7,000 located just a few miles to the west of Glacier NP. The town features nice shops, restaurants, pubs, and even a large lake with a municipal beach. Just north of town is Big Mountain, nominally a ski resort but offering gondola and chair lifts to the summit all year round. We stayed at one of the best B&Bs we have ever stayed in, the Good Medicine Lodge. The lodge is run by delightful hosts, Woody Cox, a former US agriculture administrator and his wife Betsy, who worked for Northwest Airlines for many years. They and their staff make their guests genuinely at home, and serve wonderful breakfasts that are different each day. It is definitely upscale, but worth every cent. There are many ways into the parks with Seattle the obvious gateway and connecting flights or if you wish you wish you can go via Chicago and follow our routing. do what we did. If you are driving, take US-2 or I-90 to Highway 93-N, to Whitefish. From Canada – only about 30 miles away, but make sure your US Visas are in order – head south on Highway 93. Follow the signs to Big Mountain.